Few would deny that a privately guided, chauffeur-driven tour of the town is a splendid way to go, but don’t worry if your budget doesn’t stretch quite that far. You’ll be delighted to hear there are plenty of great tour options at the free or cheap end of the spectrum. City Guides host dozens of free or inexpensive walks around London’s historic areas. All start from the City Information Centre near St Paul’s Cathedral. Popular ones include Charles Dickens Walks, London’s Burning, Roman London and Monuments to Murder. City Garden Walks lead low cost, environmentally-friendly tours of colourful gardens, ancient burial grounds, secret green spots and other downtown horticultural delights, while Walk London run free guided weekends thrice a year. Look out for their Autumn Ambles in late September and Winter Wanders in early 2018. 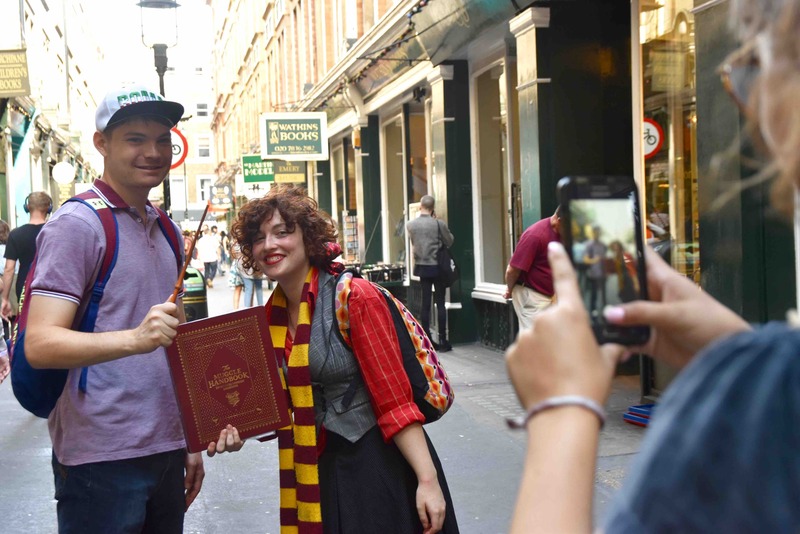 Footprints of London specialise in culture- connected walks; upcoming choices include Rumpole and the Legal Life, Constable’s Hampstead, Soho and all that Jazz and Tracing the Tudors: the Real London of Wolf Hall. Throughout October the company runs an innovative Literary Footprints Festival. London’s top museums offer free gallery tours and self-guiding trails along with free entry. 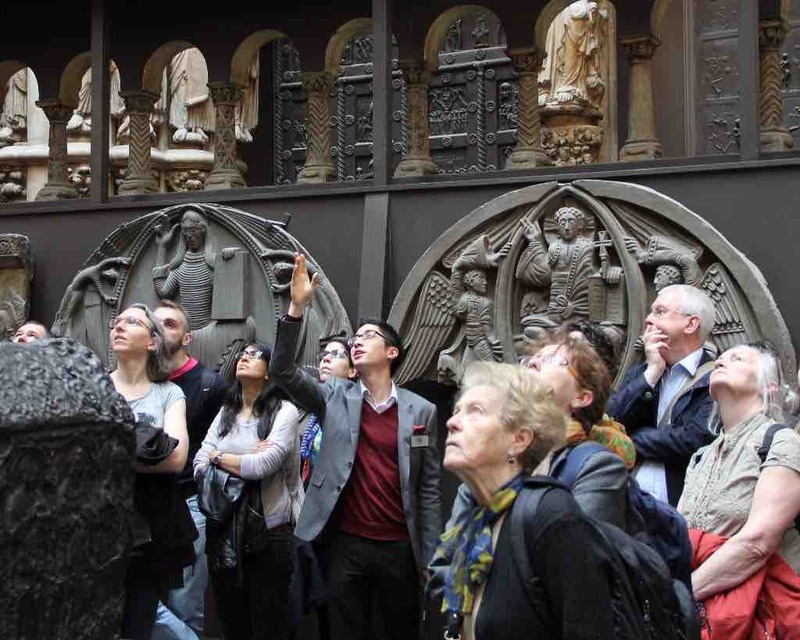 Highly recommended are daily tours at the award-winning Victoria & Albert Museum, opening your eyes to some of the treasures on display at this, the world’s greatest museum of art and design. Choose from a dazzling variety covering Theatre & Performance, Medieval & Renaissance, LGBTQ, African Heritage or Britain 1500- 1900. Many old churches run inexpensive, fascinating crypt-to-belfry tours. Try the one at lovely St Brides, with its many royal, literary and longstanding US connections like Benjamin Franklin and North Carolina’s first colonists. The East End Street and Graffiti Tour is one of the most popular daily tours offered by Free Walks by Foot. Led by a local street artist, it’s packed with visits to some of the capital’s most eclectic, shocking, beautiful and imaginative street art, from massive murals that take up entire buildings to tiny hidden treasures you’d miss if you didn’t have someone to tell you where to look. The tour is bookable and free to take, with an unpressured “pay what you think it’s worth” collection at journey’s end. Last but not least, for the mere price of a single bus ticket you can enjoy a bird’s eye view of the best of London atop an iconic red double decker bus. We recommend Heritage Route 15 for a whistlestop tour of the city’s most famous sights including Trafalgar Square, the Tower of London, St Paul’s Cathedral and the Royal Courts of Justice. Dan Vo leading the unique LGBTQ tour, Victoria & Albert Museum, photo courtesy Dan Vo and the V&A. Tally Ho Cycle Tours offer a unique way to explore London’s timeworn streets and to celebrate Britishness in a fun and quirky style. Riding a hand-built classic Pashley bicycle, a bike style you’ll recognise if you’re a fan of BBC’s Call the Midwife (think wicker baskets, comfy leather saddles and ‘ding dong’ bells), you’ll follow an energetic local guide along quiet streets and dedicated cycle lanes to see the city and get up front and personal with both iconic sights and hidden gems. As you connect the dots between each fascinating location, your guide will regale you with delightful facts and curious tales, as well as ensure you get the best photo opportunities. There’s even a stop along the way at a characterful pub for a refreshing pint of real ale with your group. Tally Ho’s founder Jack Harris confesses it was a “mix of madness and desperation” which led him to set up the company in 2011. The desire to be his own boss and move away from office-bound jobs meshed perfectly with London’s cycling revolution and two of Jack’s favourite passions, exploring by bike and visiting old pubs. “I realised there were probably many people who, like me, enjoy a good day out full of discovery topped off with a chat over a craft beer or two,” he told us. So, Jack invested in a few vintage bicycles and started leading tours. Six years and hundreds of glowing Trip Advisor reviews later, Jack’s Tally Ho has a fleet of over 60 gorgeous Pashleys and a devoted team of guides who share his passions. Three tour styles are available, with something for all ages or cycling abilities. The London Landmarks and Old City tours will immerse you in the capital’s grit, grime and glory while the Gin and Markets Ride lets you discover London through the story of gin from the 18th century to the present day and sample open air food markets full of tasty delights. The Landmarks Tour is ideal if you are new to London and is also most suitable for families since it covers the shortest distance. You’ll take in famous landmarks like Buckingham Palace, Westminster Abbey and Big Ben, stop off at an award-winning pub and visit a legal graffiti zone with a chance to have a go yourself, spray paint supplied. We loved every minute of our Old City Tour, led by the gloriously moustachioed ‘Whiskey Mick’ and his able accomplice, Harry. 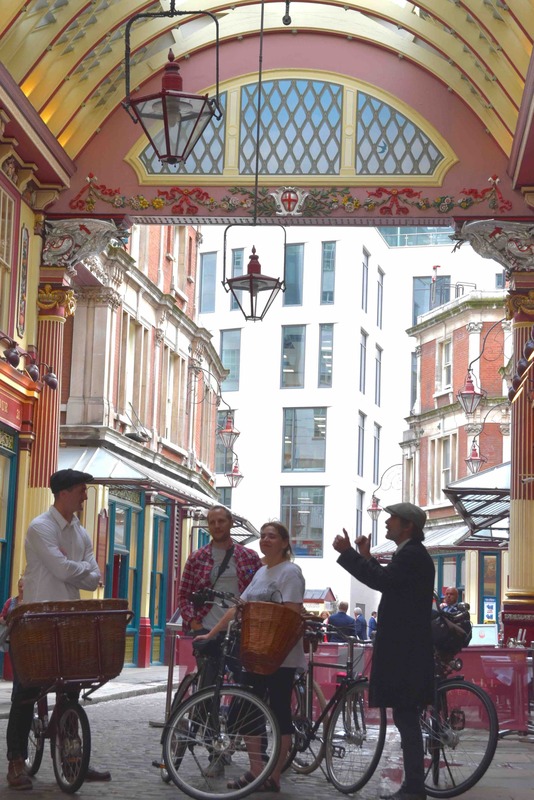 This tour is perfect for those wanting to look deeper into London’s diverse history and experience the hustle and bustle of the city with its contrasting architecture, cultures and time lines. It’s an invigorating trip through 12 miles and 2000 years of London’s past and present, illustrated with loads of Mick-style weird and wonderful facts and memorable stories. Did you know Waterloo Bridge is also known as the Ladies Bridge, entirely built by women during World War II? That the inside-out design of Lloyds of London is an example of ‘bowellist’ architecture? And although there are plenty of streets, squares and alleys in the City of London, there are no roads? Mick even gave us a lesson in Cockney Rhyming Slang as we paused beneath the bells of Bow Church and alongside a statue of colonial founding father, Captain John Smith, who is buried nearby. We pedalled cycle lanes, canals, docklands and Victorian back streets, zipped along cycle ‘Superhighways’ and wheeled our way between ultramodern skyscrapers, with nicknames like the Gherkin, the Cheesegrater, the Scalpel and the Walkie Talkie. We viewed chunks of Roman wall, atmospheric Leadenhall Market, 11th century churches, Cable Street’s anti- fascist mural, the Queen’s boat, Gloriana at St Katherine’s Dock and plenty of other sights that the natives on our tour had never seen, stopping at the city’s oldest riverside pub for a pint and a peep at the hangman’s noose out back, where smugglers and pirates met their grizzly end. Tally Ho’s tours start and end at The Walrus Pub, SE1 and cost from £25 including bike hire. Private tours can also be arranged on request. Unforgettable and highly recommended.